Create a look and feel that impresses customers and gives employees a sense of pride in their workplace with custom signs for your office building. Corporate office signage must deliver a great branding experience through visibility. This means font, size, and colors must be taken into account. We work with businesses in Minnesota and Western Wisconsin to design, fabricate, install, and regularly maintain their office signage. Our specialization of crafting signs that fit building requirements and meet city codes, is unparalleled and we’ll always meet your brand guidelines. Your business needs to be easy to find and recognizable from a distance. That is where landmarking is essential. Your corporate office signage above all must highlight your establishment, especially if your business is located in a multi-tenant building so you can stand out from the crowd. Make an impact from far away leading up to your business by having a professional, high-quality corporate office sign. Within the environment of corporate offices, branding and marketing can always change. 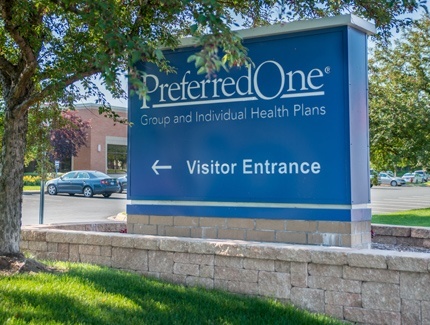 Spectrum understands corporate offices are looking to brand and what better way to do so than projecting your brand to the public with a one-of-a-kind office sign. Spectrum walks each and every client through our process beginning with a consultation, to design and fabrication, and installation. Enhance your brand to its fullest potential. Your business’s exterior office sign is imperative to give the outside world a look at your branding and creating an experience to remember for clients. With exterior office signs from Spectrum, you can be assured that what’s going on the outside of your office isn’t only impactful, but will last and impress for years to come. The sign looks great and everyone is very pleased with it. Thank you for the quick and high quality work. Also, I wanted to mention that your installer was wonderful to work with. He was patient, polite and did such a good job. Overall an A++ experience. Let's talk about a custom sign for your office space.